Instantiations has been known for their popular Java/Ajax development tools and in particular their Google Web Toolkit (GWT) designer. They’re so closely associated with it that at the top of their page, they note: “GWT Designer is not affiliated with or sponsored by Google Inc.” Except now they can change that part. Because Google has just acquired them. The company has just acknowledged the purchase on their site today and have begun to email customers notifying them of the change. As they note, the Eclipse team and the tools have been bought by Google and they plan to use the move to be able to take their software to the next level. This makes sense for Google not only because of the popular GWT Designer, but also because of the overall Ajax and Java focus. Ajax is a huge component of all Google web apps. While apps built for Google’s Android platform are built using Java. So yes, this seems to be a no-brainer. It’s not quite as splashy as the Slide buy, but it makes sense. From our new Google home, we will be able to leverage our Eclipse Java industry knowledge, award-winning technology and world class development team to continue advancing the state-of-the-art in software development tools. But first and foremost we want to say how much we appreciate your patronage and support through the years. Thank you! How does this affect you? Please rest assured that your existing Support Agreement will be honored. Our highly responsive tech support team is in place and ready to take care of you. 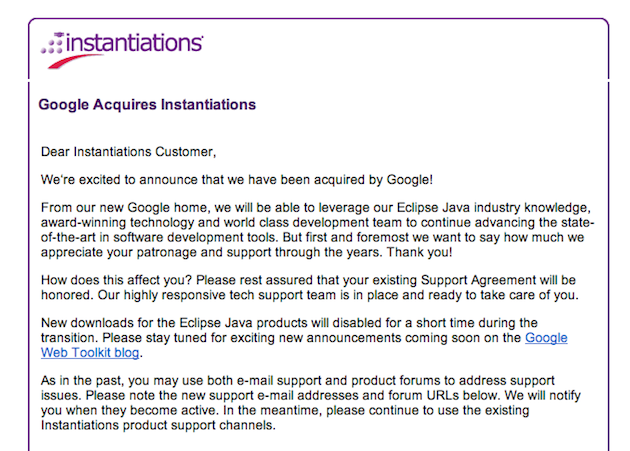 New downloads for the Eclipse Java products will disabled for a short time during the transition. Please stay tuned for exciting new announcements coming soon on the Google Web Toolkit blog. As Googlers we plan to continue to provide significant value to your business for many years.